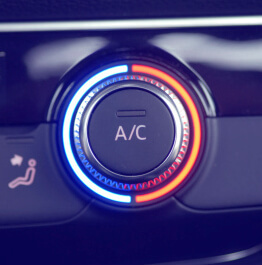 I have a bad smell coming from my A/C – how can I eliminate it? Our A/C & Heater Duct Cleaner (part #760) cleans and deodorizes automotive air conditioning systems, including the vents, ducts, evaporator core, and drain pan. It effectively eliminates odors caused by mold, mildew, stale air and smoke while providing a clean, fresh scent. What color are the caps on the low- and high-side automotive air conditioning service ports? There is no real good answer here, as they come in multiple colors. In most cases they are black, but they can be grey, blue or red. Some service port caps are marked with an “H” or an “L” to distinguish between the high and low ports. What should my vent temperature be? Vent temperature will vary based on ambient temperature and heat load on the vehicle. The warmer and sunnier it is outside, the harder your vehicle’s A/C system has to work to make cool air. Generally speaking, in a properly operating system, your vent air temperature should be 20°–40°F cooler than the outside air temperature.